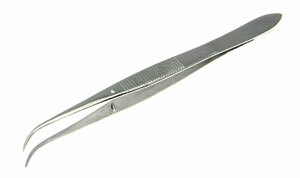 Scissors and forceps / tweezers made from stainless steel. 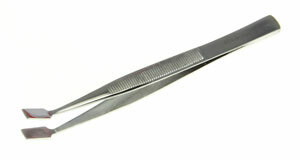 Open and closed shank scissors, sharp sharp, find point and curved. 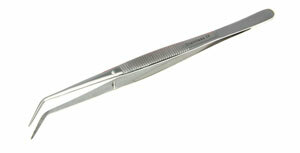 Dissection forceps, dissection tweezers, fin point, angled, rat toothed and curved forceps. With opening spring and curved blades. 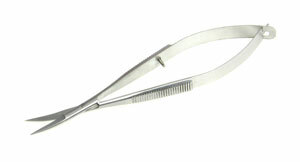 No 7 Curved 12cm - Brushed stainless steel forceps with smooth arms and very fine point. With G-pin and machined grip on arms and angled point. 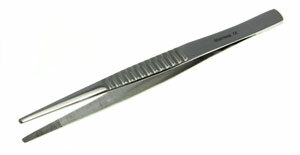 Fine pointed stainless steel scissors with curved blades. With G-pin and machined grip on arms. With machined grip on arms with blunt points.